Special Rapporteur on the promotion and protection of the right to freedom of opinion and expression David Kaye. A United Nations human rights expert today signalled concern that efforts to counter “violent extremism” may be construed as the “perfect excuse” for democratic and authoritarian governments to restrict free expression and control access to information. “By ‘balancing’ freedom of expression and the prevention of violence, the programmes and initiatives aimed at countering ‘violent extremism’ have – often purposely, sometimes inadvertently – put at risk or curtailed the independence of media,” said David Kaye, UN Special Rapporteur on freedom of expression, in a press release on World Press Freedom Day. While recognizing the important role that governments and non-State actors play in countering violence extremism (CVE) and its incitement, Mr. Kaye and his counterparts from the African Commission on Human and Peoples’ Rights (ACHPR), the Inter-American Commission on Human Rights (IACHR) and the Organization for Security and Co-operation in Europe (OSCE) raised concerns in their annual Joint Declaration that programmes to prevent or and/combat violent extremism risk undermining freedom of expression. The Joint Declaration on freedom of expression and countering violent extremism, by Mr. Kaye; Dunja Mijatovic, OSCE Representative on Freedom of the Media; Edison Lanza, IACHR Special Rapporteur on Freedom of Expression; and Pansy Tlakula, ACHPR Special Rapporteur on Freedom of Expression and Access to Information is available here. 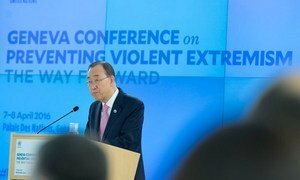 The objective of extremists “is for us to turn on each other [and] our unity is the ultimate rebuke for that bankrupt strategy,” Secretary-General Ban Ki-moon said today, underscoring that the action plan he presented to the United Nations General Assembly in January contains concrete recommendations and could be the basis of a global partnership to defeat violent extremism.